Drew has been VERY excited for his Mickey Mouse birthday party with his playgroup friends! He helped me pick out the "prizes" for his friends, which he calls "my kids." As in, "My kids gonna like Mickey Mouse prizes!" He was singing "Happy Birthday to Drew!" throughout the store as we picked out his birthday balloons. Hilarious! I guess Drew is a bit fire-shy, ever since the puppy pants episode. He did not want to look his candles in the eye. His kids helped him blow out the candles. Happier with the fire out. Tess made decorations for the party. She was sad she had to miss it. Drew was so excited to show his kids their prizes. He was jumping up and down when they came to the door: "A Mickey Mouse birthday uh-me!" Prizes and ice cream were a hit! We danced to some Mickey Mouse songs and they played toys. Because that's what we do at playgroup! Big boy Drew is getting so grown up! I've been bit under the weather, so Ry took the kids out today. When they came home, I heard all sorts of yelling and screaming from the backyard. Ry and the kids were having a blast playing in the backyard leaves. I caught these first 4 shots of them unknowingly from the window; then they spotted me in the last one! I joined them to catch a few more fall photos. We invented a fun new part of leaf raking--tarp rides! I think the pics are pretty self-explanatory. That's a lollipop Ry's mouth; he hasn't taken up smoking. Tess had planned an elaborate FHE for us, which required us to split into groups and hide envelopes for the other team to find. Dad and Tess were "Group A." Drew and Mom comprised "Group B." Once we found all the envelopes, we opened them to read gospel messages. What a cute little bug we have! Tonight I bribed that little bug into cleaning the entire living room in exchange for listening to pop songs with earphones on my iPhone. Which of course requires that she dress like Cyndi Lauper. Tess list for Saturday morning. Note the emphasis on "Mom." So Ry gave me a break and took the kids out golfing and to the park for a few hours today. They had fun and it was QUIET here! Glad to have November here. We're still basking in the glow of sugar around here. Drew was really quiet while I was on the phone with Meredith today. 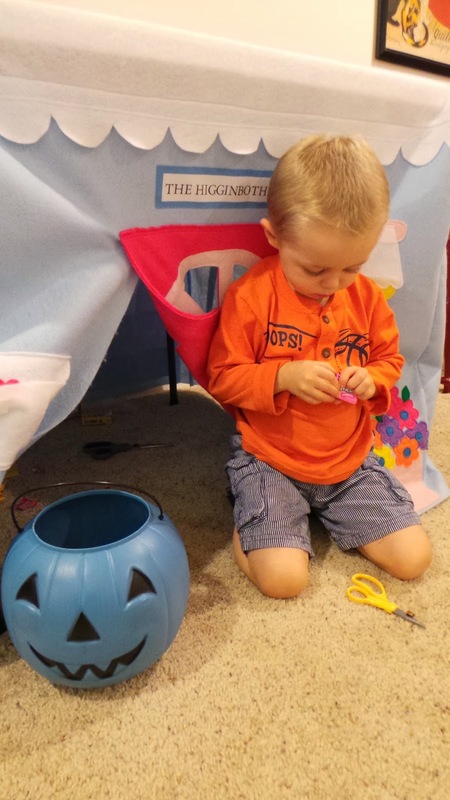 I found him down in the basement, hiding out in the playhouse with his Halloween pumpkin full of candy. The candy bandit had three different pairs of scissors and lots of candy wrappers scattered all around. Follow up report: I have to mention that he ended up vomiting 5 times in the middle of the night. Not sure whether to blame a bug or the copious amounts of candy. Tess has had lots of fun activities going on lately. 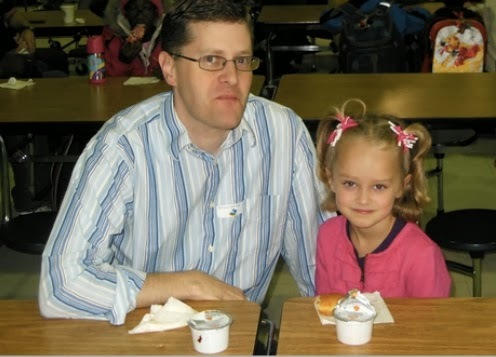 Here she is with Ry at the Donuts with Dad breakfast at school. 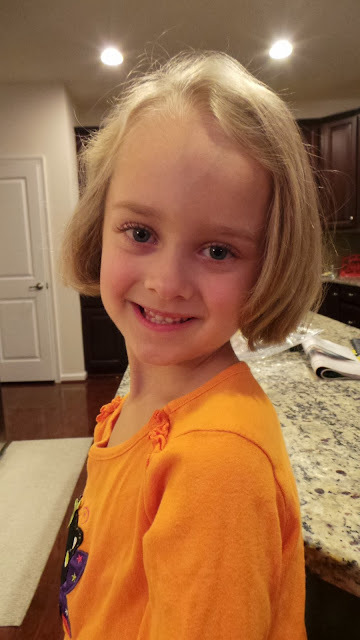 Tess has been working on growing her bangs out and we got her hair cut today. It's super cute and makes her look so grown up! 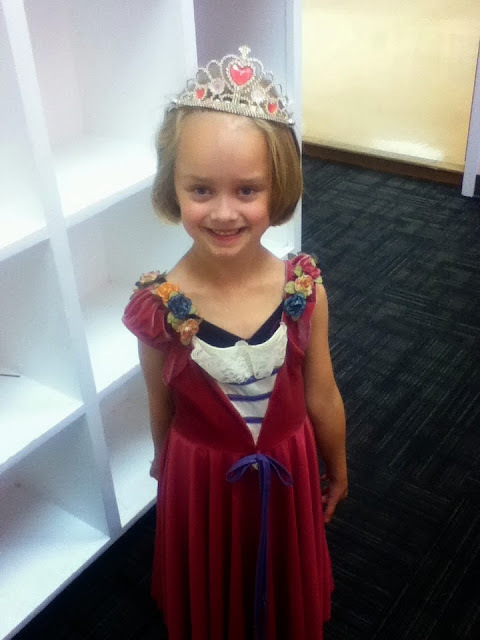 Each week at dance class, they pick a different dancer to be the "ballerina" or "jazzerina" of the day. (They switch between ballet and jazz each week.) Today Tess was jazzed to be the "Jazzerina." She got to pick a dress and crown to wear for the class. And Tess got to read to Missy the dog at school today as part of the Reading Therapy program. 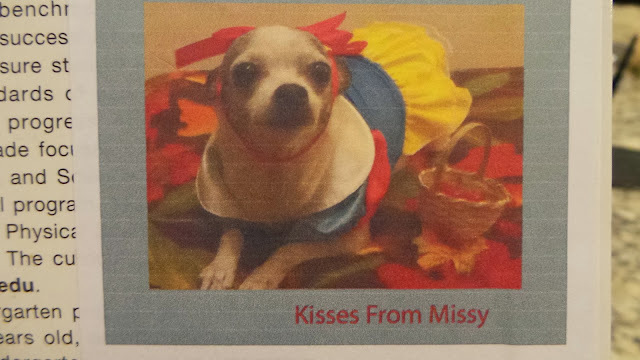 Tess loved it and she was pretty tickled that Missy was dressed up for Halloween like Snow White.